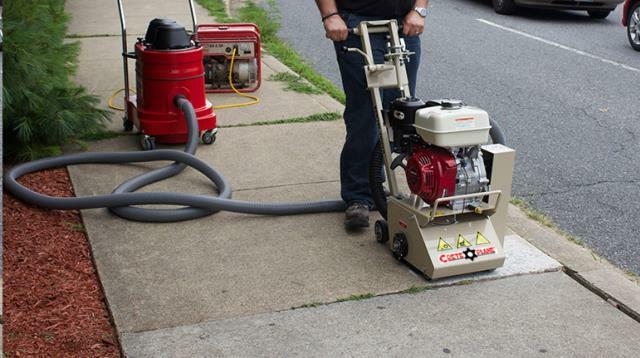 EDCO Concrete Planer/Scarifier for the gradual removal of concrete or asphalt surfaces. 8" working width will scarify approximately 350-500 Sq. Ft. per hour at a "Per Pass" maximum depth of 1/8". Removes traffic lines at approximately 800-1,000 lineal feet per hour. Ideal for removing trip hazards on sidewalks, roadways, commercial floors, etc. Ideal for removing unwanted coatings on concrete or for cleaning of existing floors for better coating adhesion. Uses tough, long-lasting Tungsten Carbide cutting wheels. For "Dust Free Applications" a DUST CONTAINMENT VACUUM is recommended and available for rent. Click here for an instructional video. * Please call us with any questions about our pkg concrete scarifier 8 inch edco rentals in Oak Grove MO, Blue Springs MO, Independence MO, Lexington MO, Odessa MO, Independence MO and Western Missouri.